After months of speculations and leaks the HTC One max is finally official. HTC's first foray into the tablet market takes heavy influence from the already released HTC One and HTC One mini. With an aluminum build with polycarbonate accents, the One max makes it clear that this is part of the HTC "One" family. The One max is equipped very similarly to the flagship HTC One with a 1080p 5.9" Super LCD 3 display, a very generous 3300 mAh battery, 1.7GHz Quad-Core Snapdragon 600 CPU, 2GB of RAM, 16/32GB of internal storage with microSD card expandability to 64GB, NFC, LTE 4G, 4 "Ultra pixel" rear camera (without optical image stabilization) and the latest tech trend to make a comeback, a finger print scanner. It also comes with Android 4.3 and their newest version of Sense 5.5. No word on Canadian availability, but with the popularity of "phablets" in Canada we wouldn't bet against it making its way to the Great White North. Check out the first look video and official press release after the break. 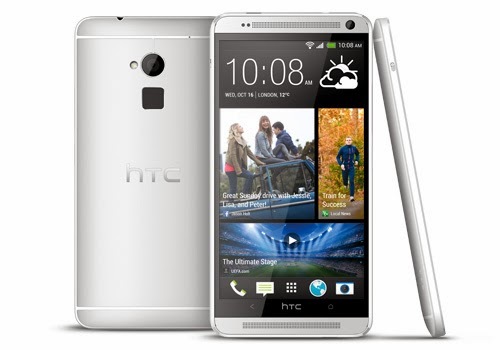 The HTC One max's 5.9" full HD1080p display is perfect for enjoying photos, videos and movies on the go. Smooth and efficient performance comes courtesy of a quad-core Qualcomm® Snapdragon™ 600 processor featuring a quad-core 1.7 GHz CPU enabling jaw-dropping performance, ultra vivid videos and booming sound. Whether you're watching videos in stunning HD, playing games or checking out what's hot online, the HTC One max sounds amazing, looks sharp and keeps working when you need it. Founded in 1997, HTC Founded in 1997, HTC Corp. (HTC) is the creator of many award-winning mobile devices and industry firsts. By putting people at the center of everything it does, HTC pushes the boundaries of design and technology to create innovative and personal experiences for consumers around the globe. HTC's portfolio includes smartphones and tablets powered by the HTC Sense® user experience. HTC is listed on the Taiwan Stock Exchange (TWSE: 2498). For more information, please visit www.htc.com.